Definition at line 26 of file CQProgressItemBar.h. Definition at line 27 of file CQProgressItemBar.cpp. Definition at line 38 of file CQProgressItemBar.cpp. Definition at line 127 of file CQProgressItemBar.cpp. References CCopasiParameter::DOUBLE, CCopasiParameter::getType(), CCopasiParameter::INT, CQProgressItem::mpItem, mStart, pdelete, CCopasiParameter::Value::pDOUBLE, CCopasiParameter::Value::pINT, CCopasiParameter::Value::pUINT, CCopasiParameter::UDOUBLE, and CCopasiParameter::UINT. Referenced by initFromProcessReportItem(), and ~CQProgressItemBar(). Definition at line 151 of file CQProgressItemBar.cpp. References CQProgressItem::mpItem, mStart, and CCopasiParameter::Value::pVOID. Definition at line 45 of file CQProgressItemBar.cpp. References destroy(), FROM_UTF8, CProcessReportItem::getEndValue(), CCopasiObject::getObjectName(), CCopasiParameter::getValue(), mEnd, mLastSet, CQProgressItem::mpItem, mStart, mValue, CCopasiParameter::Value::pVOID, and reset(). Definition at line 63 of file CQProgressItemBar.cpp. References mCurrentValue, mLastSet, and mpSetValue. Definition at line 76 of file CQProgressItemBar.cpp. References C_FLOAT64, C_INT32, CCopasiParameter::DOUBLE, CCopasiParameter::getType(), CCopasiParameter::INT, mEnd, mFactor, CQProgressItem::mpItem, mpSetValue, mStart, mValue, CCopasiParameter::Value::pDOUBLE, CCopasiParameter::Value::pINT, process(), CCopasiParameter::Value::pUINT, setValueFromDOUBLE(), setValueFromINT(), setValueFromUINT(), CCopasiParameter::UDOUBLE, and CCopasiParameter::UINT. 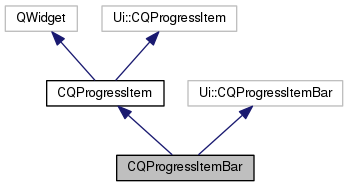 Definition at line 118 of file CQProgressItemBar.cpp. References C_INT32, mCurrentValue, mFactor, mStart, mValue, and CCopasiParameter::Value::pDOUBLE. Definition at line 121 of file CQProgressItemBar.cpp. References C_INT32, mCurrentValue, mFactor, mStart, mValue, and CCopasiParameter::Value::pINT. Definition at line 124 of file CQProgressItemBar.cpp. References C_INT32, mCurrentValue, mFactor, mStart, mValue, and CCopasiParameter::Value::pUINT. Definition at line 45 of file CQProgressItemBar.h. Referenced by process(), setValueFromDOUBLE(), setValueFromINT(), and setValueFromUINT(). Definition at line 41 of file CQProgressItemBar.h. Referenced by initFromProcessReportItem(), and reset(). Definition at line 40 of file CQProgressItemBar.h. Referenced by reset(), setValueFromDOUBLE(), setValueFromINT(), and setValueFromUINT(). Definition at line 44 of file CQProgressItemBar.h. Referenced by initFromProcessReportItem(), and process(). Definition at line 39 of file CQProgressItemBar.h. Definition at line 42 of file CQProgressItemBar.h. Referenced by destroy(), init(), initFromProcessReportItem(), reset(), setValueFromDOUBLE(), setValueFromINT(), and setValueFromUINT(). Definition at line 43 of file CQProgressItemBar.h. Referenced by initFromProcessReportItem(), reset(), setValueFromDOUBLE(), setValueFromINT(), and setValueFromUINT().